Effective soil management is critical to achieving climate change mitigation in plant-based renewable energy systems, yet limitations exist in our understanding of dynamic belowground responses to the cultivation of energy crops. To better understand the belowground dynamics following cultivation of a grassland in a high-yielding tropical perennial C4 grass in a zero-tillage production system, changes in soil carbon (C) pools were quantified, modeled, and projected and the chemical composition of the aggregate-protected pool was determined in support of the simulated dynamics. 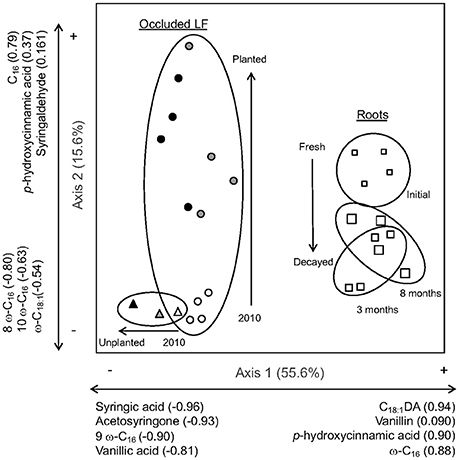 Multiple C pools with different ecosystem functions and turnover increased following cultivation: immediately available microbial substrate (measured as hot water-soluble C) and active C (determined through laboratory incubation) increased by 12 and 30% respectively over time and soil C accumulated significantly in multiple physical fractions. A more rapid and dynamic nature of multiple C pools and transfers between pools existed than is often assumed in belowground models used widely in the field to simulate soil C accumulation. Multiple indicators of fresh roots, including the more easily degraded lignin monomers and root-derived long chain substituted fatty acids, appeared in aggregate-protected pools of cultivated soils over time since planting. This rapid transfer of plant inputs through active and intermediate C pools into mineral-dominated pools is the ultimate outcome required for building soil C stocks. Initial model runs suggested that this is evident, even on a 2-year frame, in transfer rates of 0.485 and 0.890 from active to slow and slow to passive pools respectively. The rapid transfer of fresh root-derived input to stable pool suggests that soil C under zero-tillage management may be resilient to disturbances, such as replanting following a kill-harvest, that would otherwise result in losses from unprotected or readily available pools. Soil carbon (C) loss as a result of land use change during cultivation of biofuel feedstocks negatively impacts the net global warming mitigation potential of a renewable fuel production system (Gibbs et al., 2008; DeLucia, 2016), but losses can be minimized, or C accrued, with sustainable management practices (Cornelissen et al., 2013; Gelfand et al., 2013). Soil organic matter is a dynamic C pool that is responsive to disturbances such as land preparation for cultivation and subsequent crop choice and management practices (Shrestha et al., 2015). Belowground C dynamics, i.e., the shift in C pool size and transfers in response to tillage, altered inputs, and time following cultivation, may ultimately drive the soil C sequestration potential for an agroecosystem (Lehmann and Kleber, 2015). Understanding the processes controlling the belowground C dynamics is a critical component to predicting the net soil C change during cultivation of biofuel feedstocks in different biomes, and therefore to planning a production system with no net change or, ideally, a net gain in soil C over time. Currently, maximizing the stabilization of C (through interaction with clay surfaces and within aggregates) is a central component to recommendations for long-term soil C management for climate change mitigation (Lal, 2013). However, life cycle analyses (i.e., computational tools for assessing the efficiency and greenhouse gas impact) for biofuel systems (Davis et al., 2009) still struggle with the assumptions surrounding the representation of important belowground processes, such as stabilization mechanisms, that drive soil C dynamics (DeLucia, 2016; Paustian et al., 2016). Because of these insufficiencies and the resultant inaccuracy of soil C projections, small-scale farmers, land managers, and industry may fail to include the potential C benefit of crop and management choices in their planning (Tennigkeit et al., 2013; FAO, 2015). With increasing social costs of climate change, the potential market value of C may be as high as $105 MgCO2e-1 by 2025 (Dietz and Stern, 2015). Emerging C markets mean that managing agricultural soils organic C storage may provide substantial opportunities for both environmental and economic sustainability. Tropical, perennial C4 grasses cultivated with a zero-tillage, ratoon-harvest management are strong candidates for a lignocellulosic biofuel feedstock in Hawaii and other tropical regions. After initial planting, stalks are cut 2–6 cm from the soil surface to preserve the belowground system and allow vegetative regeneration. In a previous study, the greatest determinant of soil C accumulation 20 months post-cultivation of tropical perennial grasses was low root lignin concentration. Specifically, that roots with low lignin concentration decayed rapidly and accumulated as soil C, rather than being respired and lost as CO2 (Sumiyoshi et al., 2016). Understanding the processes controlling belowground C dynamics of an agroecosystem is critical to developing a sustainable production systems that will draw down more C from the atmosphere than they emit. Therefore, more evidence was sought to definitively connect cultivated grass inputs and measured C pools with previously observed net gains in total soil C.
In this study, we investigated whether or not rapid accumulation of fresh root-derived inputs in multiple pools (i.e., not just in the most active, high turnover pools, but also in more protected, stabilized pools) could explain observed C accumulation following the cultivation of perennial grasses. Incorporation of inputs from the cultivated grasses into intermediate pools over just a few years suggests a potential for longer-term stabilization, and therefore climate change mitigation, within the agroecosystem. From empirical data collected for input rate, total C stock, and C pool sizes over time since cultivation, transfer rates among pools may be modeled to help understand the C dynamics and project ecosystem responses beyond our measurement capability. Several hypotheses were tested to assess the effect of land use change on belowground soil C dynamics. (1) Following preparation tillage if left unplanted, labile (i.e., readily degradable) and unprotected pools of organic matter deplete over time as microbial communities utilize these C pools without renewed plant inputs. (2) It was hypothesized that the extensive belowground root systems and associated rhizosphere of a cultivated tropical perennial C4 grass would increase both the active (i.e., readily available, labile, and unprotected organic debris) and the aggregate-protected C pools to result in the previously observed C accumulation in the whole soil. (3) If root lignin concentration drives decomposition and the subsequent organic C accumulation within aggregates, then the decay trajectory of root biomolecular composition should provide an indicator for recent root tissue that could be traced into the aggregate-protected fraction. If supported, these results will provide direct evidence for the incorporation of fresh root inputs into multiple soil C pools resulting in the previously observed rapid net soil C accumulation under zero-tillage, ratoon harvested cultivation of tropical perennial grasses in Hawaii. The study occurred on the island of Oahu at the Waimanalo Experiment Station (21°20′15″N, 157°43′30″W). The mean annual precipitation is 63.5–127 cm, with 72% falling between the months of November and April, and the mean annual temperature is 22.2–23.8°C (Soil Survey staff, accessed 11/12/2015). The soil is a Mollisol of the Waialua series, a very-fine, mixed, superactive, isohyperthermic pachic haplustolls with alluvium parent material (Soil Survey staff, accessed 11/12/2015). The soil is moderately well drained and is considered prime agricultural land if irrigated (Soil Survey staff, accessed 11/12/2015). To prepare for planting, the field initially underwent tillage with a disk tiller to 15 cm. Four napiergrass (Pennisetum purpureum) varieties (bana, purple, Merkeron, and a pearl millet × dwarf napiergrass cross hybrid or PxD) were planted in a randomized complete block design with four replicates, with each variety grown in 2 × 3 m trial plots (Figure 1). Ultimately, statistical power was too low to test for variety differences; therefore, we chose simply to focus on changes in C pools and chemistry over time within the planted and unplanted plots. Thus, for the cultivated plots, there are 16 replicates. Nylon weed mats were used in the 0.6 m buffer between each plot as well as between rows to inhibit weed growth. The grasses were planted in November 2009 and harvested three times on March 2010, November 2010, and July 2011. At each ratooning, grasses were cut 10 cm aboveground and carried away from the plots. Drip irrigation was applied three days per week from 2009 to 2011. The soils were fertilized as common farmer practice (granular triple-16 formulation, rate of 53 kg N, 23 kg P, 44 kg K per ha) by broadcast on the surface on November 2009 and November 2010 after the harvest. Figure 1. Map of the field layout at the Waimanalo Experimental Research Station. 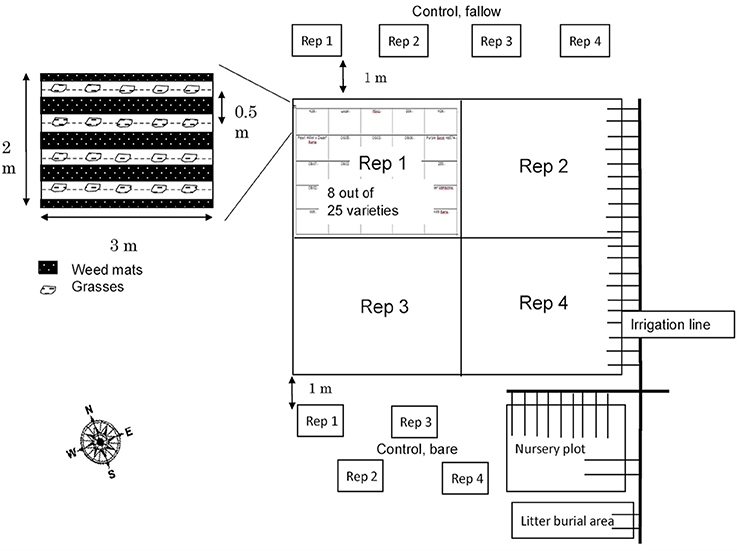 Adjacent to the primary variety trial plots, quadruplicate bare soil plots were established and maintained within the tilled, but outside the fertilized and irrigated area, as plant-free in order to avoid additional C inputs (“unplanted”) (Figure 1). Multiple long-term experiments have used the no-input approach to observe the amount and nature of stabilized soil organic matter that remains and soil physical/chemical/biological properties that change in the absence of plants and detrital inputs (e.g., Barré et al., 2010; Lajtha et al., 2014). In the current study, the unplanted plots allowed us to better observe short-term changes in soil organic matter dynamics. Tracking losses of organic matter in unplanted plots, while concurrently tracking gains in cultivated plots, gave us confidence that the effects of cultivated grasses on soil C pools and dynamics were isolated, and allowed observation of rapid losses of soil C over short time periods with the removal of inputs. Soil samples were taken at each planted and unplanted plot on April 2010, August 2011, and July 2012 (referred to as “2010,” “2011,” and “2012”). In each plot, four soil cores were collected with a 5-cm diameter core sampler at depth of 0–15 and 15–30 cm. Before this study, the field was a maintained grassy area for the last 24 years. However, the discovery of an impenetrable plow layer at approximately 30 cm suggested a prior history of intensive cultivation. Sampling through this layer was impossible, in fact, soil pits at the periphery of the field site confirmed roots also could not penetrate this layer. Soil cores were collected from the inter-row area of the cultivated plots, at the midpoint of the wet and dry gradient resulting from the placement of the drip irrigation tubes at the base of the planting row. Random sampling locations were selected within constraints imposed by the edge buffer, wet-dry gradient, and other permanently installed sampling equipment. The soil samples were brought back to the lab and air-dried at 25°C for 1 week. Then, the soils were sieved to less than 2 mm and stored at room temperature. Identifiable roots that passed through the sieve were picked out by hand, to a practical extent. Soil C stocks were determined using the equivalent soil mass method optimal for detecting changes over time in studies where bulk density may be affected by the management change itself (Davidson and Ackerman, 1993; Wendt and Hauser, 2013; Crow et al., 2016). Sumiyoshi et al. (2016) previously described the detailed method. Briefly, a linear interpolation of the amount of soil C per a mass of soil at two points down a soil profile allows the calculation of C stock per a reference mass of soil. Normalizing C to a common soil mass, instead of a volume, allows for the detection of change over time. The reference soil mass in this study was selected to be 300 kg m−2 because that was approximately the mean mass of all soil samples collected at a depth of 30 cm. Soil C stock and pools are subsequently reported as g C m−2 in 300 kg of soil m−2. Four replicate grass plots also were established in the adjacent undisturbed, unfertilized, and not irrigated grassland (referred to as “baseline grass” plots) (Figure 1). No soil samples were collected prior to the start of the trial, so the samples from baseline grass plots collected in 2010 are used as a best reference for the initial, fallow soil properties. Data are not reported for these plots over time because as the trial proceeded, guinea grass began to invade the surrounding area including the baseline grass plots. As a result of the guinea grass invasion, the soil properties were altered and no data were collected once it was clear that there was no way to control the invasive grasses. If low root lignin concentration drove root decomposition and organic matter accumulation within aggregates, then the decay trajectory of root biomolecular composition should provide an indicator for recent root tissue that could be traced into the occluded light fraction (Filley et al., 2008; Crow et al., 2009). To provide root tissue for the decay trajectory, a concurrent litterbag decomposition study was started in December 2010 (please refer to Sumiyoshi et al., 2016 for details). Root material collected from live plants on each plot was divided into five bags and buried 3.5 cm into the soil at a 45° angle at an area adjacent to the plot, which was then irrigated and covered in weed mat (Figure S1). Bags were randomly collected on months 1, 2, 3, 5, and 8 from each plot. Upon collection, bags were rinsed and dried at 75°C. Hot water soluble C (HWSC), a proxy for immediately-available microbial substrate, was determined for each sample, by combining 3 g of soil with 30 ml DI water into a 50 ml centrifuge tube and then placed on an end-over-end shaker for 30 min at room temperature (Ghani et al., 2003). The samples were then centrifuged for 20 min at 2,776 g and the supernatant was then filtered through a 0.45 μm cellulose acetate membrane and stored in a separate vial to measure cold-water soluble C. In the same centrifuge tube, an additional 30 ml of DI water was added to the soil sample, shaken for 10 s, and then placed into a hot-water bath for 16 h at 80°C. The samples were shaken for another 10 s then centrifuged for 20 min at 2,776 g and the supernatant filtered through a 0.45 μm cellulose acetate membrane and stored in a separate vial to measure for HWSC. The total C for all samples was determined using total organic C (TOC) analyzer (TOC-V CHS/CSN, Shimadzu Corporation, Kyoto, Japan). The amount of active C, readily accessed by microbial metabolism, was determined by 191-day laboratory incubation (Paul et al., 2006). Prior to incubating, the soils were brought to field capacity and 10 g of each sample and 0.25 ml of inoculum made from fresh soil were placed into individual incubation chambers with septa set into the lids. Incubation chambers were placed in controlled environment chambers (Model 6021-1, Caron Products & Services, Inc., Marietta, OH) set at 21°C. Samples equilibrated in their partially closed chambers at the set temperature for 48 h before sampling began. An initial 6 ml headspace sample was taken from the open chamber, the lid placed back on the chamber and the chamber put back into the incubator. At the start of the next sampling day, a final 6 ml headspace sample was taken from the closed chamber through the septa. The lid was then removed and a new initial sample taken; this cycle was repeated on days 1, 2, 5, 8, 13, 18, 23, 28, 33, 38, 48, 62, 78, 93, 107, 121, 135, 149, 163, 177, and 191. The samples were analyzed for CO2 (Clarus 580 Gas Chromatograph, Perkin Elmer Inc., Waltham, MA) and the gas flux determined by subtracting the initial CO2 concentration from the final CO2 concentration then converting to units of C efflux per gram of C-soil by utilizing the ideal gas law. Soil physical fractionation isolates various C pools that differ in size and turnover and respond to changes in the soil environment over time (von Lützow et al., 2007). Physical fractionation methods often solubilize the most labile pools of C (such as those detected by HWSC and active C measured during incubation of whole soil), but provide critical measurements of C pool size that are integrative of all in situ soil processes that affect the overall C balance of a system (Crow et al., 2007). The method originally described by Golchin et al. (1994), which separates bulk soil into free light fraction (unprotected organic debris), occluded light fraction (aggregate-protected organic matter), and dense fraction (mineral associated organic C) by a combination of density and ultrasonic energy input (please also refer to Swanston et al., 2002 and Crow et al., 2014) was used. Twenty grams of 2 mm sieved soil and 100 ml 1.8 g ml−1 density sodium polytungstate (SPT) (SPT-0, SOMETU) were put into a cone centrifuge bottle, gently shaken, and centrifuged in an Eppendorf Centrifuge at 1,305 g for 10 min. Material that floated (free LF) was aspirated, rinsed with deionized water, filtered, and dried at 65°C for 24 h. Remaining material in the centrifuge bottle was sonicated (150 J ml−1 total) for 1.5–2 min in order to release the occluded LF from the aggregates (505 Sonic Dismembrator, Fisher Scientific, FB-505-110). Next, the mixture was centrifuged for 10 min at 1,305 g and the floating materials aspirated; this process was repeated until no floating material remained. Aspirated materials (occluded LF) were filtered and dried like the free LF. Lastly, deionized water was added to the centrifuge bottle along with the remaining mixture, centrifuged for 10 min, and the supernatant removed. This process was repeated until the mixture achieved a density of 1.0 g ml−1 indicating the SPT was completely removed. The dense fraction was then dried for 24 h at 65°C. Statistical analysis was performed using JMP Pro version 11 (SAS, Cary, NC). One- and two-way ANOVAs with interactions and repeated measures when comparing years were used with Tukey post hoc tests to determine which variables were significantly different. Data was assessed for normality and homoscedasticity. The planted plots are not compared statistically to the unplanted (bare) plots because of the non-random plot assignment. Subsamples were taken from the occluded LF isolated from the field trials and root tissue from the litter decay study to undergo cupric oxide (CuO) oxidation and extraction using the method of Hedges and Ertel (1982), modified by Dalzell et al. (2005). Because of the resource intensiveness of the process, subsamples from each replicate were composited for each experimental unit. Each subsample was oxidized in analytical duplicate, extracted using ethyl acetate, silanized, and analyzed on a QP-2010 Ultra GC/MS (Shimadzu, Columbia, MD). Identification and quantification of the mass spectral response of 11 lignin structural phenols (Hedges and Ertel, 1982) was completed using an internal standard (ethyl vanillin) and an external calibration curve of authentic lignin phenolic compounds (Table 1). 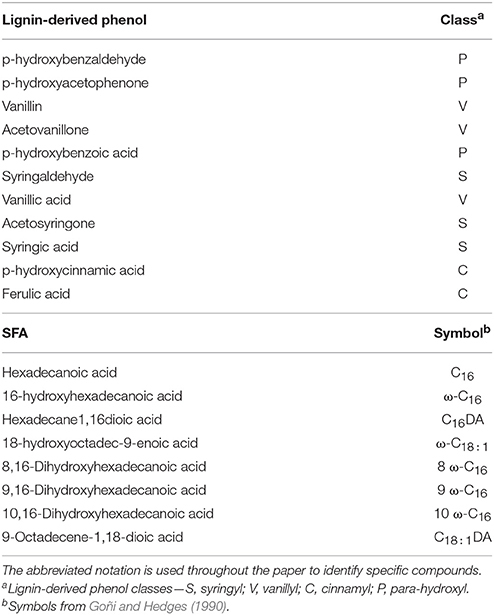 Cutin and suberin-derived saturated fatty acid (SFA) components of the CuO oxidation (Hedges and Ertel, 1982; Dalzell et al., 2005) were identified and quantified similarly to lignin-derived products, however, DL-12-hydroxystearic acid was used as an internal standard. Proxy compounds with identical mass spectral quantization fragments used for external calibration when authentic SFA compounds where not commercially available. Table 1. Lignin-derived phenols and substituted fatty acids (SFA) isolated by CuO oxidation, extraction and quantification by GC-MS.
Lignin monomers that are extracted as breakdown products of the CuO oxidation method can be placed in four classifications based on differences in structural side chains: cinnamyl (C), p-hydroxy (P), syringyl (S), and vanillyl (V) (Table 1; Hedges and Ertel, 1982). The P-lignin monomers other than p-cinnamic acid are not well resolved in the literature for terrestrial ecosystems as being specifically plant or microbial product-derived, therefore are not discussed in the interpretation although they remain in the analyses. The SFA components are generally described by length of C backbone and location of hydroxyl groups and double bonds (Table 1; Goñi and Hedges, 1990). Increasing relative abundance of acid (Ac) and aldehyde (Al) based monomers, indicated by Ac/AdV and Ac/AdS ratios, is indicative of the state of degradation of plant material as they undergo microbial processing (Hedges et al., 1988; Filley et al., 2008). The measured values of lignin-derived phenols and SFA for all compounds identified were used to examine compositional differences in plant and selected soil particulate fractions to establish a trajectory of decomposition and incorporation of plant-derived debris into soil fractions over time. Compositional similarities and differences among fresh root tissue, decayed root tissue, and particulate organic matter from the occluded light fraction of planted and unplanted plots over time were examined by non-parametric principle components analysis (PCA) using the PC-ORD software package (MjM Software Design, v.7) (Crow et al., 2008). Absolute lignin concentrations of each monomer, or single phenol-containing compound, were relativized to the total amount of extracted lignin of each sample (i.e., the ratio of individual monomers to total lignin monomers is used to track shifts in the predominant monomers). Individual SFAs were similarly relativized to SFA totals. The relativized data represent the predominant composition of organic material within each sample and therefore is more appropriate than absolute concentration to determine the biological nature, or source/decay state, of organic matter (Crow et al., 2008). The PCA used a correlation cross products matrix to produce correlation coefficients among the compounds and broken stick eigenvalue. The broken-stick eigenvalue was less than the actual eigenvalue for the first and second axes. Therefore, two axes were used for interpretation and Pearson and Kendall correlations with the main matrix were calculated in PC-ORD. where each ki represents the cycling rate for each pool i, and the coefficients αi,j represent the proportion of decomposed C from pool j transferred to pool i. The coefficients γi represent the proportion at which the total initial amount of C is split between the three pools. Figure 2. Conceptual diagram depicting the structure of the model expressed in Equation (1). C1, free light fraction; C2, occluded light fraction; C3, dense fraction; each C pool has its own decomposition rate ki, and transfers among pools are represented by the coefficients αi,j. We used the data from the soil physical fractionation (C1, free light fraction; C2, occluded light fraction; C3, dense fraction) to fit the model of Equations (1) and (2) using a two-step parameter optimization. First, we used the Nelder-Mead (Nelder and Mead, 1965) or the pseudo-random search optimization algorithms (Soetaert and Petzoldt, 2010) to find the parameter set that minimizes the difference between model predictions and observations. Second, we used the results from this initial optimization to run a Bayesian optimization using Markov chain Monte Carlo (Soetaert and Petzoldt, 2010). In all cases, we report the best parameter set obtained by the initial optimization and the uncertainty in parameter values and predictions obtained by the Bayesian procedure. To predict potential changes in C stocks and pools over time as an effect of land use change, we ran forward simulations from 2013 to 2016 and assessed whether the system would gain or lose C during this time frame. The amount of HWSC, a proxy for immediately-available microbial substrate, changed over time for planted and unplanted plots. In the planted plots HWSC increased between 2010 and 2011 (p = 0.0076) from 0.40 ± 0.01 mg HWSC g-soil−1 in 2010 to 0.44 ± 0.02 mgHWSC g-soil−1 in 2011 and 0.43 ± 0.02 mg HWSC g-soil−1 in 2012 (Figure 3A). For reference, the baseline grass plots in 2010 had 0.63 ± 0.08 mg HWSC g-soil−1. In contrast, for the unplanted plots, HWSC decreased each year from 0.60 ± 0.02 mg HWSC g-soil−1 in 2010 to 0.52 ± 0.01 mg HWSC g-soil−1 in 2011 and 0.42 ± 0.01 mg HWSC g-soil−1 in 2012 (p < 0.0001) (Figure 4A). Figure 3. For the planted soils in 2010, 2011, and 2012: hot water soluble carbon (HWC) concentration (A), cumulative CO2 efflux in mg C-CO2 g C-soil−1 at incubation day 191 (B), and C stock within physical fractions (The SPT soluble fraction, labeled “loss” was calculated by difference. DF is dense fraction, occ LF is occluded light fraction, and free LF is free light fraction) (C). The values are means ± 1 standard error; different letters indicate difference in each fraction by year. Mean value for the baseline grass plots is shown as a reference line. Figure 4. For the unplanted soils in 2010, 2011, and 2012: hot water soluble carbon (HWC) concentration (A), cumulative CO2 efflux in mg C-CO2 g C-soil−1 at incubation day 191 (B), and C stock within physical fractions (The SPT soluble fraction, labeled “loss” was calculated by difference. DF is dense fraction, occ LF is occluded light fraction, and free LF is free light fraction) (C). The values are means ± 1 standard error; different letters indicate difference in each fraction by year. Mean value for the baseline grass plots is shown as a reference line. Similarly, cumulative C respired during incubation (representative of the amount of active, readily accessible C to microbes for metabolism), normalized to the amount of soil C in order to constrain C quality as the dependent variable, increased significantly over time for the planted plots from 0.111 % of total C in 2010 to 0.143% of total C in 2012 (Figure 3B). Cumulative C respired from the unplanted soil did not change significantly over time due to high variability, but decreased by 55% on average from 2010 to 2012 (Figure 4B). In the planted plots, free light fraction C (i.e., unprotected organic debris) increased from 2010 to 2012 and occluded light fraction, and dense fraction C increased from 2010 to 2011 (Figure 3C). Unexpectedly, occluded light fraction C declined again to 2010 levels in the planted plots. The total C stock from the baseline grass plots was 2,980 ± 137 g C m−2 in 150 kg soil in 2010. Consistent with results reported in Sumiyoshi et al. (2016), total soil C stock increased from 2,768.2 ± 47.7 g C m−2 in 150 kg soil in 2010 to 3,124.3 ± 50.2 g C m−2 in 150 kg soil in 2012 for an average of 1.8 Mg C ha−1 yr−1. Without plant input, C in free light fractions and C in occluded light fractions both declined significantly over time (Figure 4C). Dense fraction C declined as well in the unplanted plots, however the p-value is slightly over 0.05 for change over time. Organic substrate is vital to the sustenance of an abundant microbial community and requires inputs to the system in order to maintain a constant supply. Without fresh plant inputs to the agroecosystem, the immediately-available microbial substrate (HWSC), unprotected organic debris (free light fraction), and aggregate-protected (occluded light fraction) pools all declined; together contributing to the observed total soil C decline in unplanted soils following preparation tillage of the grassland. Although these results are unsurprising, it is important to document the rapid decline in soil organic matter pools in tropical systems when soil is left fallow, bare, or abandoned. The duration of this field trial was short compared to others in temperate systems; however, C cycle processes proceed more rapidly in tropical environments. The intent of tracking changes in C pools with no inputs was to emphasize the role that fresh perennial grass inputs have in maintaining critical belowground dynamics by comparison. In fact, changes in multiple C pools under cultivation already were detectable even without this comparison. The flow, or transfer, of C from litter to organic matter (Cotrufo et al., 2015) and between mineral pools is critical to the soil C balance of ecosystems (Lehmann and Kleber, 2015). Interactions with minerals or protection within aggregates (Schmidt et al., 2011) limits the accessibility of organic substrates to microbial oxidation, thereby influencing C flow through an ecosystem. The cultivation of high yielding perennial grasses for biofuel feedstock nearly always results in increased root production, biomass, and exudates (Anderson-Teixeira et al., 2013; Beniston et al., 2014). These inputs then have variable concomitant effects on aggregate formation and turnover, decomposition of older organic matter, and organo-mineral interactions (Tiemann and Grandy, 2015; Blankinship et al., 2016). As a result, C sequestration under perennial grass cultivation varies widely across systems and soil types (Anderson-Teixeira et al., 2009; Tiemann and Grandy, 2015). Sumiyoshi et al. (2016) reported up to 3.9 Mg C ha−1 yr−1 (to ~30 cm) and Pawlowski et al. (2017) measured up to 13–17 Mg C ha−1 yr−1 (to ~1.2 m), which is greater than the range reported by Lemus and Lal (2005). Similarly, an experiment in India with short rotation woody crops that reported 5.6 Mg C ha−1 yr−1 on average over an 8-yr study (Garg, 1998) and a tropical sorghum study in Texas that found 5.0 Mg C ha−1 yr−1 (to appx 1.0 m) over 5 years (Dou et al., 2014). The hypothesis that the extensive belowground root systems and associated rhizosphere of perennial grasses would increase both the active (i.e., readily available, labile, and unprotected organic debris) and the aggregate-protected C pools to result in the total observed accumulation of soil C was confirmed. The results showed that immediately available microbial substrate (HWSC) and active C (respired during incubation) increased over time with cultivation of napiergrasses and that soil C accumulated in multiple pools and contributed to the observed increase in soil C stock. Similarly, in temperate systems, 6 years of switchgrass-Miscanthus hybrid cultivation increased particulate organic C faster than total C stock compared to conventional corn rotation (Kantola et al., 2017). Accumulation of C in multiple C pools with a range of turnover and degree of stabilization, as opposed to just the most labile or particulate debris pools, suggests potential for resilience of the accumulated C to future disturbances. The total concentration of lignin-derived phenols (∑SVC) ranged from 143–168 mg g−1C in root tissues and from 22–48 mg g−1C for occluded light fractions (please see Table S1 in Supplementary Materials for all compound-specific results). In the unplanted samples, ∑SVC decreased from 40–26 mg g−1C from 2010 to 2012 and the Ac/Al ratio (an indicator of decay state) increased from 0.42 to 0.47 in V-lignin monomers and 0.44 to 0.55 in S-lignin monomers. Over the same time, ∑SVC of planted samples decreased similarly (e.g., from 42–27 mg g−1C for one variety); however, in the planted samples Ac/Al ratios did not increase suggesting inputs of fresher, less decayed tissue. Instead, Ac/Al ratios stayed the same or even decreased, e.g., Ac/Al of S-lignin monomers was 0.38 in 2010 and 0.39 in 2012 for one variety. The total concentration of SFAs in the root tissue was lower than for lignin monomers, between 9.34 and 18.6 mg g−1C; but, the total concentration of SFAs in the occluded fraction was similar in magnitude to the ∑SVC, between 11.5 and 21.0 mg g−1C. In the compositional analysis, Axis 1 of the PCA accounted for 55.6% of the total variation within the relativized dataset and Axis 2 accounted for additional 15.6% (Figure 5, Table S2). Samples that cluster together are more similar in chemical composition, often suggesting a relationship between input sources and organic matter fractions. Axis 1 predominantly separated the roots from the occluded light fractions, with roots being more correlated along the positive side of the axis with a high relative abundance of C18:1DA, vanillin, p-hydroxycinnamic acid, and ω-C16, while the occluded light fractions were more correlated with the negative side of the axis and high relative abundance of syringic acid, acteosyringone, 9 ω-C16, and vanillic acid. Compositionally, the occluded light fraction in the unplanted plots became even more correlated with the negative side of the axis over time. Figure 5. Principal components analysis of the relativized lignin-derived phenols and substituted fatty acids (SFA) from CuO extraction from roots (white squares; samples from initial roots are small, 3-month decay are medium, and 8-month decay are large) and occluded light fractions from planted (circles) and unplanted (triangles) soils (samples from 2010 are white, 2011 are gray, and 2012 are black). To facilitate interpretation of results and discussion, clusters of different sample types are encircled and arrows represent observed shifts in chemistry over time. Axis 2 of the PCA separated fresh root tissue from the decayed root tissue measured at 3 and 8 months in the litterbag study, while the occluded light fraction showed movement away from initial planting conditions, and all unplanted plots irrespective to time, based on increased planting age. The occluded light fractions from the first year of the planted plots and all of the unplanted plots were clustered toward the negative side of Axis 2, which was most correlated with the SFAs 8 ω-C16, 10 ω-C16, and ω-C18:1, and similar in composition to the decayed root along Axis 2. With plant inputs, the occluded fraction shifted up along Axis 2 in some cases nearly equal along the axis to the fresh root inputs, which were correlated with p-hydroxycinnamic acid and syringealdehyde. In this study, we sought chemical evidence for the incorporation of root-derived C into aggregate protected C pools to explain the previous observation that low root lignin concentration resulted in high root decomposition rate and subsequent soil C accumulation (Sumiyoshi et al., 2016). The decay indicator and compositional analysis suggest that roots entered aggregate-protected pools rapidly following cultivation; some components then preferentially remain while others are lost or transferred to other pools. Multiple indicators of lignin-rich, fresh roots appeared in aggregate-protected pools of all planted soils over time. For example, the more easily degraded lignin monomers, p-hydroxycinnamic acid and syringalhdehyde (Opsahl and Benner, 1995), were abundant in both the fresh roots and occluded light fraction of planted soils over time. Further, root-derived long chain substituted fatty acids associated with suberin were conserved in the occluded fractions. As lignin-derived compounds degraded over time without fresh inputs, acid forms of lignin monomers increased along with the C16 and C18 substituted fatty acids. These compounds often are associated with degradation and accumulation in mineral soil (Rasse et al., 2005; Crow et al., 2009), but here also contributed to the aggregate-protected component of organic matter within the occluded fraction. To project the trajectory of total soil C and physical C pools over time with and without plant inputs, we fitted a three-pool model to measured density fractions (to generate the partitioning coefficients γi) in the unplanted and planted field treatments thereby simulating values for the decomposition rates ki and transfers αi,j. For projections out 3 years to 2016, all C fractions decreased in the unplanted soil (Figure 6A), whereas they increased in the planted treatment (Figure 6B). With belowground inputs, larger increases were observed over time for the dense fraction than for the free and occluded light fractions. Figure 6. Field-based three pool model parameter projections for the best-fit model of the unplanted plots (A), planted plots (B), and the difference (C). The best-fit models showed that C additions through planting were mostly associated with increases in the transfer of C among pools (Table 2). Specifically, only an increase in C transfer from the light fractions to the dense fraction, i.e., from the free LF to occluded LF to dense fraction (α2,1 for unplanted = 0.005 and 0.485 for planted and α 3,2 for unplanted = 0.008 and 0.0.890 for planted) or directly from free LF to dense fraction (α3,1), could explain the accumulation in C stock with cultivation. In addition, exchange was evident between the free and occluded LF (α2,1 and α1,2). No formal analysis on transfer rates is available to compare to our results. In models such as Century and RothC, transfer rates are modulated based on reported clay or clay + silt content (Sierra et al., 2012). Other models such as TECO or CLM4cn use constant transfer rates (Luo and Weng, 2011; Wieder et al., 2014). The structure of these models is slightly different than the structure presented here, but TECO reports a rate of transfer from the fast to the slow pool of 0.296 and from the slow to the passive pool as 0.001. In contrast, CLM4cn uses a rate of transfer from the fast to the slow pool of 0.54 and from the slow to the passive pool as 0.45. These rates range widely amongst each other and in comparison to the rates obtained in this study, which highlights a large uncertainty in appropriate transfer rate values and suggests that more research is needed on this topic. Table 2. 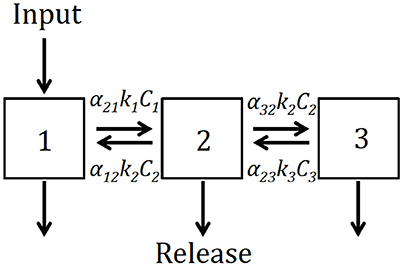 Field-based three pool model parameter estimates and summary statistics for the best-fit model. The differences between the modeled responses for all fractions showed that over time the increase in C stocks due to planting become larger than the decreases due to input removals (Figure 6C). Only during the first 2 years of the experiment the decrease in C stocks of the occluded light fraction were higher than the increases due to planting, but this effect was reduced over time and the size of this fraction is expected to become larger after the second year. In the latter years, transfers of plant inputs into the dense fraction resulted in the predominant process of C accumulation. Without plant root and rhizosphere inputs, total C losses over time are dominated by the changes within the occluded light fraction whereas gains when cultivated are being driven by changes in the dense fraction. Soil C accumulation with cultivation in this system was driven by gains in the dense fraction as a result of the model-predicted transfers from the free organic debris (free LF) and aggregate protected organic matter (occluded LF) to the mineral-dominated dense fraction. The selection of varieties with large, robust root systems that add substantial residues to the soil through turnover (which includes high proportion of root death and rapid decomposition) post-harvest would seem to promote soil C gain. Two pathways for this gain may be promotion of root residue in aggregates and transfer of root-derived organic matter and microbial biomass or byproducts into the mineral-dominated soil. This transfer to mineral pools occurs more rapidly than previously thought. Although the experimental design did not allow a direct statistical confirmation, the mean planted soil C stock in 2012 exceeded the reference fallow soil C stock in 2010 suggesting rapid re-accrual of C lost during a preparation tillage or kill-harvest cycle necessary to maintain yields or repair irrigation lines. The timeframe of this study captured a dynamic window of change following cultivation of a fallow grass field into tropical perennial C4 grasses under zero-tillage management. Our results are in contrast to other sites that showed immediate losses of aggregate-protected C following cultivation of fallow fields into annual crops (Six et al., 1998; Guo and Gifford, 2002; Grandy and Robertson, 2006; Mueller et al., 2012). Our results also are contrary to some that showed decreases in soil C following land use change to occur in light and heavy fractions, whereas increases in soil C due to improved management only increased the light fraction (Tan et al., 2007). In this study, within 3 years of cultivation in perennial grasses, multiple soil C pools rebounded to rebuild total C stock and set a trajectory for soil C accumulation in years to come. Perennial grasses increased multiple soil C pools with important functional roles as microbial substrate. Evidence for decay products of recent root turnover in aggregates further suggests active transfer of organic matter from fresh plant inputs to accumulation of C within mineral-dominated pools via aggregates. The transformation and transfer of root-derived inputs to the mineral-bound soil dynamics point to a more rapid and dynamic nature of the belowground system than is often assumed in belowground models used to determine the sustainability of a bioenergy system. 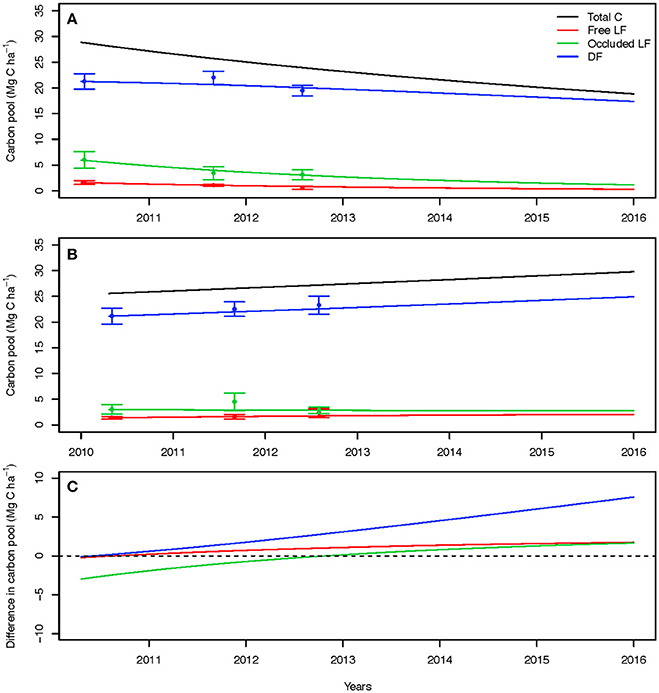 The net climate change mitigation of a biofuel system improves when soil C accrues during feedstock production, and is potentially high in tropical perennial grass systems. The dynamic nature of the processes also indicate potential resilience of soil C to disturbance and inertia to continue accumulating soil C over time - if kept in zero-tillage management with sustainable intervals of replanting or other disturbance. SC generated the ideas, secured funding, managed the project, mentored student researchers, and maintained editorial control of the manuscript; SC and LD wrote the main manuscript text and prepared final figures; LD ran all statistical comparisons; CS modeled the fractionation data in SoilR; JW collected and analyzed the data presented in Figure 5. All authors reviewed the manuscript. This work was supported by the Department of Energy [award number DE-FG36-08GO88037], Office of Naval Research [N00014-12-1-0496 and N00014-16-1-2221], United States Department of Agriculture (USDA)-Agricultural Research Service [Specific Cooperative Agreement 003232-00001], USDA-National Institute of Food and Agriculture (NIFA) grant number 2012-10006-19455, and the USDA NIFA [HAW01130-H]. We thank Andrew Hashimoto for his support of this research and Richard Ogoshi, Brian Turano, and Roger Corrales and the field crew at the Waimanalo Agricultural Research Station, College of Tropical Agriculture and Human Resources, University of Hawaii at Manoa for their work on the field trial. Nathan Hunter, Hironao Yamazaki, and Yudai Sumiyoshi conducted fieldwork and/or collected laboratory data used in the final manuscript. Figure S1. Plot design of the litterbag decay experiment. Table S1. Concentrations (mg g−1C) of extracted substituted fatty acids (SFA) and SVC-Lignin, S-to-V ratio (S/V), C-to-V ratio, and decay state [acid (Ac) to aldehyde (Ad) ratio for S- and V-Lignin classes] of lignin-derived phenols. Table S2. Correlations between quantified lignin-derived phenols and SFAs and the first two axes of the PCA. The amount of variation explained by each axis is in parentheses. DeLucia, E. H. (2016). How Biofuels Can Cool Our Climate and Strengthen Our Ecosystems. EOS. FAO (2015). Meeting the 2015 International Hunger Targets: Taking Stock of Uneven Progress. Rome: FAO. Tennigkeit, T., Solymosi, K., Seebauer, M., and Lager, B. (2013). Carbon intensification and poverty reduction in kenya: lessons from the kenya agricultural carbon project. Field Actions Science Reports Online Special Issue 7. Available online at: http://factsreports.revues.org/2600 (Accessed May 25, 2016). Copyright © 2018 Crow, Deem, Sierra and Wells. This is an open-access article distributed under the terms of the Creative Commons Attribution License (CC BY). The use, distribution or reproduction in other forums is permitted, provided the original author(s) and the copyright owner are credited and that the original publication in this journal is cited, in accordance with accepted academic practice. No use, distribution or reproduction is permitted which does not comply with these terms.